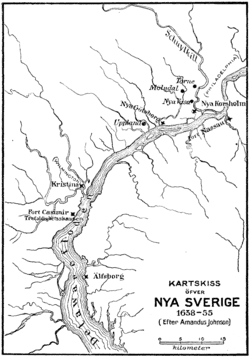 New Sweden (Nya Sverige, Uusi Ruotsi) was a Swedish colony along the lower reaches of Delaware River in North America from 1638 to 1655 in the present-day American Mid-Atlantic states of Delaware, New Jersey, and Pennsylvania. 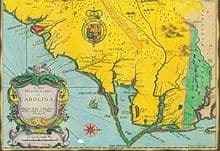 Fort Christina, now in Wilmington, Delaware, was the first settlement. Along with Swedes and Finns, a number of the settlers were Dutch. Some Germans also came to the colony as soldiers in the Swedish army. New Sweden was conquered by the Dutch in 1655, during the Second Northern War, and incorporated into New Netherland.